The Medium Combustion Plant (European) Directive (MCPD) is an instrument targeted at reducing air pollution by bringing in emission controls for combustion plants in the 1-50MWth range. The MCPD was supported by the UK as it will deliver a cost-effective improvement in air quality. The Directive requires all plants in scope to be registered or permitted and sets limits on the levels of pollutants that these plants can emit according to their type, size, age, fuel type and annual operating hours. It also requires operators to test emissions from their plants to demonstrate compliance with emission limits. The MCPD must be transposed into UK law by 19 December 2017. The controls will apply to new plants from December 2018. Existing plants must comply with requirements from 2024 or 2029, depending largely on size. Full implementation will be achieved in 2030. This legislation will be implemented in the UK. The European MCPD will be added to ENV Air in the Cardinal Environment EHS Legislation Registers and Checklists. Consultation has occurred in England, Scotland, Wales and Northern Ireland. The consultation response is published (England and Wales) here. England : the Environment Agency will be appointed as the regulator in England. For higher risk plants, where the impact on local air quality must be assessed to determine permit conditions, Local Authorities will be consulted. The Environment Agency will consult on fees and charges as part of its strategic review of charges. Wales : the Welsh government is considering the matter of regulatory responsibility in relation to plant in Wales. A statutory UK Plan for tackling roadside emissions of nitrogen dioxide (NO2) is published today. The documents are here. • Clean Air Fund, for local authority bids for additional money to support the implementation of measures to improve air quality. This could include interventions such as improvements to local bus fleets, support for concessionary travel and more sustainable modes of transport such as cycling, or infrastructure changes. These interventions could enable local authorities to avoid the imposition of restrictions on vehicles, such as charging zones. To ensure the Fund fits the specific needs of each local area there will be a competitive process through which local authorities bid for support. Further details will be announced later in the year. • £100 million for retrofitting and new low emission buses. As announced in the 2016 Autumn Statement, the government will provide this funding for a national programme of support for low emission buses in England and Wales, including hundreds of new low emission buses and retrofitting of thousands of older buses. (3) local plans (produced by local authorities, local authorities already have responsibility under the Local Air Quality Management system brought in by EU law) are to be developed and implemented at pace so that air quality limits are met (presently the UK breaches air quality limits on a routine basis in some locations). Initial local plans by end March 2018. Final local plans by end December 2018. These plans will be subject to DEFRA approval, if not approved, measures will be mandated. (4) local authorities are to consider a wide range of innovative options, exploring new technologies and seeking to support the government’s industrial strategy so that they can deliver reduced emissions in a way that best meets the needs of their communities and local businesses. Their plans could include a wide range of measures such as: changing road layouts at congestion and air pollution pinch points; encouraging public and private uptake of ULEVs; using innovative retrofitting technologies and new fuels; and, encouraging the use of public transport. If these measures are not sufficient, local plans could include access restrictions on vehicles, such as charging zones or measures to prevent certain vehicles using particular roads at particular times. However, local authorities should bear in mind such access restrictions would only be necessary for a limited period and should be lifted once legal compliance is achieved and there is no risk of legal limits being breached again. The 2017 Plan does not suggest that any or all of these obligations will be mandatory, unless the local plans prove insufficient. (5) a new Automated and Electric Vehicles Bill will allow the government to require the installation of charge points for electric vehicles at motorway service areas and large fuel retailers, and to make it even easier to use electric vehicle chargepoints across the UK. This drive towards cleaner technology and zero emission transport will be reinforced by both the Clean Growth Plan and the Industrial Strategy, including investment in science and innovation through the Industrial Strategy Challenge Fund. (6) checks by the pre-existing Market Surveillance Unit will be increased to ensure that new and existing vehicles on UK roads meet the standards that they were approved to. Medium Combustion Plants (MCPs) are widely used to generate heat for large buildings (offices, hotels, hospitals, prisons) and industrial processes, as well as for power generation, and have been largely unregulated for emissions to air. In addition, there has been rapid growth in the use of generators with high NOx emissions in Great Britain which is expected to continue. Modelling indicates that such generators can lead to local breaches of the statutory hourly mean limit value for NO2. The UK and Welsh Governments consulted on new statutory measures to reduce emissions from MCPs and generators in 2016 with a view to introducing emission controls in England and Wales from the end of 2018, to improve air quality. The response to the consultation, published on 11 July 2017, sets out the controls which will be introduced into legislation by the end of 2017. Scotland and Northern Ireland consulted in 2016 and 2017 respectively on measures to reduce emissions from MCPs within the same timescale as England and Wales, and sought views on controlling emissions from generators. Also, new diesel and petrol cars and vans will be banned in the UK from 2040 in a bid to tackle air pollution, the government has announced. This is a separate pledge. Today the European Union (Withdrawal) Bill was given its First Reading in the House of Commons. The purpose of this Bill (when enacted) is to repeal the European Communities Act 1972 (ECA) on the day the UK leaves the European Union (scheduled to be 29th March 2019). The principal purpose of the Bill is to provide a functioning statute book on the day the UK leaves the EU. As a general rule, the same rules and laws will apply on the day after exit as on the day before. It will then be for Parliament and, where appropriate, the devolved legislatures to make any future changes. (4) maintains the current scope of devolved decision making powers in areas currently governed by EU law. Subscribers to Cardinal Environment Limited Tailored EHS Legislation Registers and Law Checklists for the UK, and the regional variants, England, Wales, Scotland, Northern Ireland, and Britain, and England &a Wales, will be substantively affected by the law changes created by this Bill and other Brexit UK laws. To assist the transition, we will add an additional direct linking webpage to both the Health and Safety, and the Environmental Registers access. This page will give direct access to the Brexit laws, and their explanatory notes. Please keep following this bLog for updates. The European Union (Withdrawal) Bill is found here. The Explanatory Notes are here. UPDATE : the EU position paper dated 20th September 2017 sets out the current position – this document is here. 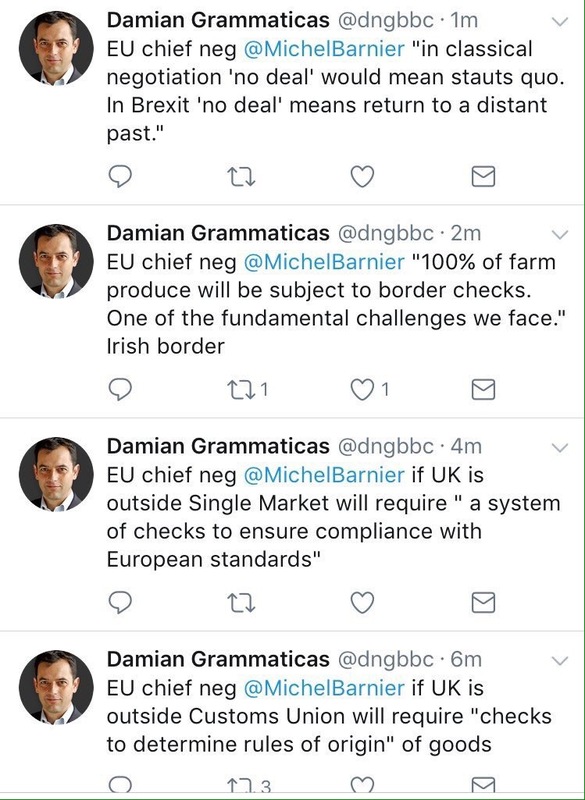 In a speech this morning Michel Barnier set out the implications for customs and rules of origin checks to operate from 30 March 2019 00:00h CET (when the UK is a third country as respects trade with the EU). This post is updated with a link to the EU position paper of 20th September. 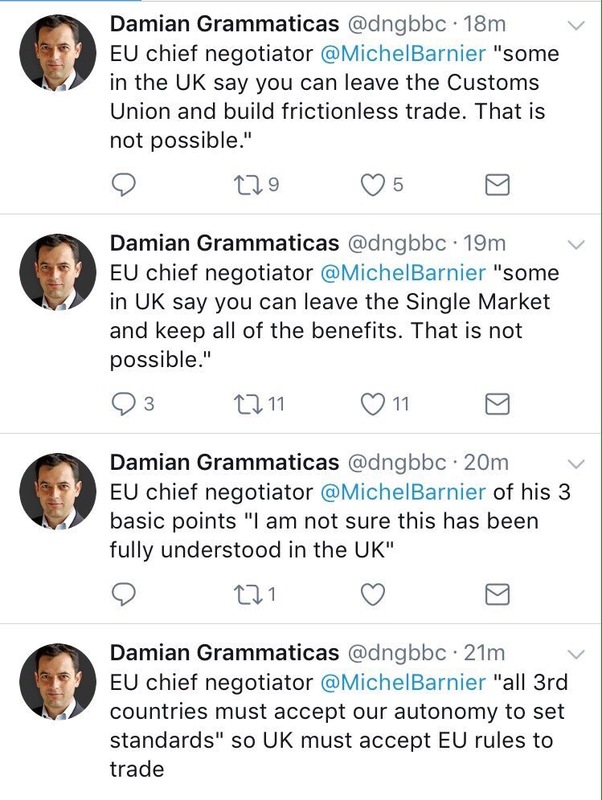 The images are screen grabs of the tweets of BBC correspondent Damian Grammaticas who attended the speech. Note: this information could alter if transitional arrangements are agreed, or indeed if a EU-UK trade agreement materialises. Note: this Blog has an environment and health and safety focus, please refer elsewhere for more detailed information on third country customs and single market trading rules. On 2nd May 2017 the European Commission and the European Medicines Agency (currently based in London) issued a Q&A document. This first list of questions and answers addresses the establishment requirements (within the EEA), and will be updated. (6) batch release sites (for certification) must be located in the EEA.